In total, the presentation of our solution (including its variations) consists of more than 400 pages. We noted that the challenges that we were facing during the development of the solution were not uniformly distributed over the entire sequence. Rather, sections with relatively low complexity alternate with those that are characterized by extremely high complexity. To make the entire process of the solution more comprehensible and more manageable for reading, we have decided to divide the structural representation into three main phases. The separation of these three phases is based on the variations density (= number of variations shown per move). First, we give "Technical Notes" (in addition to the "Summary of Our Solution") to those who are more interested in the problem, or even want to investigate it on their own. This is followed by the presentation of the "Main Path of Our Solution", and finally the "Variations of Our Solution" are explained in detail. 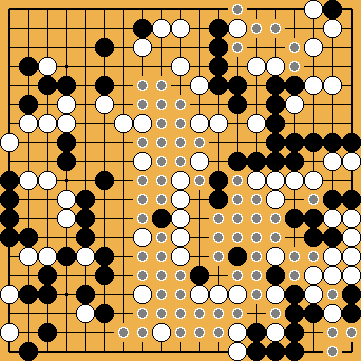 The moves in phase 1 take place in the marked area on the right side of the board, and in the centre. The left side of the board is not affected yet. The development follows the clockwise direction, starting in the lower right corner, passes through the centre, and finally reaches the upper right corner. Both sides are in imminent danger of making some "natural-looking" - but non-optimal - moves, or missing some "counter-intuitive" - but correct - moves, where the effect will only be seen much later.